Suzuki Intruder receives minor upgrades for this year. The updated cruiser is available in a new colour and some mechanical changes. Suzuki has started the FY 2019-20 with the launch of 2019 Intruder. The modern cruiser gets a new Metallic Matte Titanium Silver paint job. It is now available in Metallic Gray/Metallic Black, Grey and Red and Black/Metallic Titanium Silver. Along with this, the 2019 Suzuki Intruder gets a revised gear shift design and an improvised brake pedal. These updated will improve the riding ergonomics and comfort of the riders. The carburettor variant goes for Rs 1,01,368 and the Fuel-injected variant goes for Rs 1.08 Lakhs (prices ex-showroom Delhi). It is now costlier by nearly Rs 1500. The engine specifications of the 2019 Suzuki Intruder remains the same. It gets powered by a 154.9cc air-cooled engine, that is capable of producing 14 BHP at 8000 RPM and 14 Nm at 6000 RPM. The motor comes mated to a 5-speed gearbox. Speculations suggest that with the introduction of BS-6 engines, the cruiser will get a revised engine. The specifications might remain the same, but it will offer more performance as well as refinement. For suspension purposes, Intruder gets telescopic forks at the front and a swing arm type mono-shock at the back. Suzuki has equipped it with 17-inch tires at both the end, with a radial tire at the back. Also Read: 2019 Suzuki Gixxer launch expected this month – What’s new? 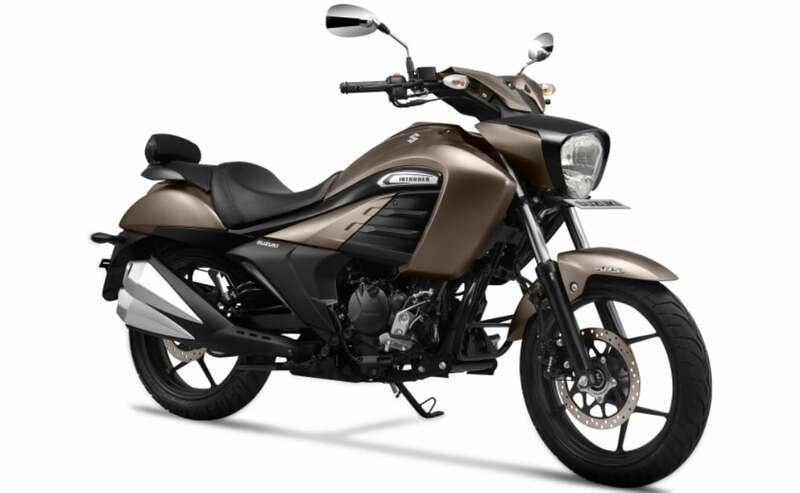 Suzuki had updated the Intruder with ABS much earlier that the safety regulations. It gets a front and rear disc brake with a single-channel ABS setup. Features onboard include projector headlamps with LED position lights, LED tail lamp, a fully digital instrument console, Twin-exhaust port, split seats and backrest as a standard fitment. Suzuki Intruder faces competition from Bajaj Avenger and no one else. The Avenger 180 and 200 are both priced near to the Suzuki cruiser.